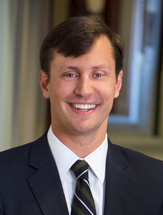 Ben Thorpe is an associate who represents plaintiffs and defendants in complex trial and appellate litigation. Prior to joining the firm, Ben served as a law clerk to the Honorable Frank M. Hull in the U.S. Court of Appeals for the Eleventh Circuit. Ben received his law degree from the University of Georgia School of Law. As a member of the appellate litigation clinic, Ben argued before the U.S. Court of Appeals for the District of Columbia. He received his undergraduate degree in economics from the Andrew Young School of Policy Studies at Georgia State University.